Pablo Zabaleta got injured in the 106th minute of extra time. The Argentine defender collided with Netherlands forward/wing back Dirk Kuyt. 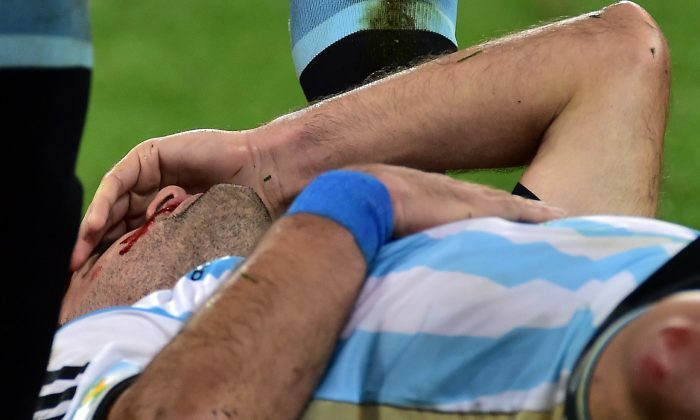 Zabaleta appeared to have cut his mouth. RIO DE JANEIRO (AP) — When Argentina plays the Netherlands in the World Cup semifinals on Wednesday, it will be a matchup of arguably the two best attacks in the tournament. No less than five of the world’s best forwards could be on the field, which would normally raise expectations of a flurry of goals and end-to-end attacking football. But there’s too much at stake for either team to push forward relentlessly, meaning that the game in Sao Paulo is about much more than its star strikers. Jasper Cillessen was relatively untested internationally going into the World Cup, having made his Netherlands debut last year. But the Ajax goalkeeper has been solid, although not spectacular, in keeping two clean sheets and limiting defending champion Spain to just one goal from a penalty. But he still has a long way to go before joining the ranks of great Dutch goalies like Edwin van der Sar and Hans van Breukelen, and was substituted for Tim Krul for the quarterfinal penalty shootout against Costa Rica. Sergio Romero was only a backup for his club Monaco this past season but has been the Argentina starter since 2009, and is vastly more experienced than Cillessen. While Argentina’s strength is its attack, the team needed a number of key saves by Romero to keep Iran scoreless in a 1-0 win in the group stage. He has three clean sheets in Brazil, including in both knockout games. With Argentina’s back four seen as the team’s weakness, Romero has helped make sure the team only conceded three goals in five games. Netherlands coach Louis van Gaal surprised many by adopting a five-man defensive line for this tournament, although in truth the two wingbacks have been pushing forward just as much as the midfielders. The strategy has been effective, though, and will likely be used again to neutralize Argentina’s explosive attack. Daley Blind has been one of the World Cup’s best defenders but may again have to fill in for the injured Nigel de Jong in midfield. Dirk Kuyt, normally a forward, has also looked vulnerable defensively in his new role as left back. Argentina’s defense was seen as its main weakness going into the World Cup, but has grown increasingly solid as the tournament progressed. Switzerland and Belgium were both held scoreless in the knockout stages — the Swiss through 120 minutes — although neither team features an attack as dangerous as the Netherlands. Pablo Zabaleta anchors the back four while his Manchester City teammate Martin Demichelis may again get the nod after performing well against Belgium. Both teams are without a key piece to their midfield, although the respective effects will be vastly different. Nigel de Jong has long been the Dutch team’s bruiser, a tough tackler who shores up the defense and disrupts the other team’s play — often by any means necessary. His absence because of a groin injury will likely give Lionel Messi more room to maneuver, which could easily prove decisive. Another problem for the Dutch is that Wesley Sneijder — one of the best players at the 2010 World Cup — has looked well past his prime in Brazil. For Argentina, Angel Di Maria has been one of the team’s best players going forward, constantly using his pace to take on defenders and help create chances for the forwards. With Di Maria sidelined with a thigh injury, Ezequiel Lavezzi will have to take on a bigger role on the wing. Argentina does have a strong foundation in the middle with Javier Mascherano playing in front of the back four and providing both leadership and hard tackles. This is the area where both teams field world-class players. Dutch duo Robin van Persie and Arjen Robben tore defenses apart in the group stage, scoring three goals each, but have been kept fairly quiet in the knockout rounds. Van Persie was also struggling with a stomach complaint on the eve of the game. An even bigger problem for the Netherlands is that Argentina’s front line is even more intimidating. With Lionel Messi playing alongside Gonzalo Higuain and the fit-again Sergio Aguero, Argentina has an attack that is unrivaled in international football. Aguero may not start, though, having missed the last two games with a thigh injury. While Argentina has won three of its games by 1-0 scorelines in Brazil, Messi has shown repeatedly that he can provide a winning goal when his team needs it the most.